Get maximum activity and stability in proteomic applications with Thermo Scientific™ Pierce™ LysN Protease, MS Grade, a highly purified native Lys-N protease. 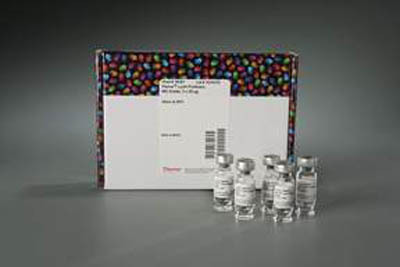 Thermo Scientific Pierce LysN Protease, MS Grade, is highly purified native Lys-N protease that has been validated for maximum activity and stability in proteomic applications. LysN protease is active over a wide range of temperatures and denaturing conditions. Efficient protein digestion can be completed in 2 hours at 50°C or 4 hours at 37°C, however, digestion is possible at both lower and higher temperatures. LysN also remains active under moderate denaturing conditions including 0.1% SDS, 6M urea or heating to 70°C. Maximal LysN activity occurs at pH 7 to 9. The lyophilized enzyme is stable for 2 years when stored at -20°C, and reconstituted stock solutions of LysN are stable at -80°C for 2 years or -20°C for one year without significant loss in activity.